Price and Where to Buy: Around $200, available on GuavaFamily.com and Amazon. 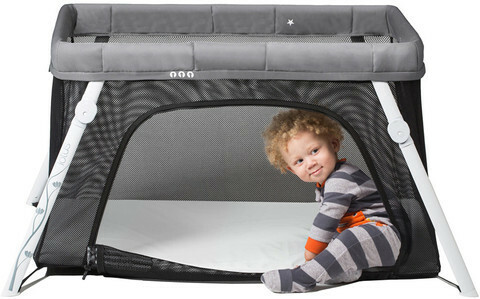 Pros: The crib is incredibly easy to set up and take down. I was able to put it together in about 30 seconds without even reading the instructions first (I of course then went back and verified I’d done everything correctly). The mattress seems relatively comfortable compared to those in similar travel-cribs. It’s longer than the typical playard-type travel bed, which is great for taller toddlers who aren’t quite ready for a big-kid bed or air mattress. And the zippered side goes a long way toward winning over small occupants (who like the novelty factor of having play access), and the fact the zipper is only on the outside (and therefore not accessible to little hands) is handy for naptime and nighttime use. Cons: Because it’s custom-sized, a standard crib sheet won’t fit correctly. So if you want a fitted sheet, you’ll need to buy one that’s specific to the crib ($20, available on GuavaFamily.com). Usefulness: 10/10 After years of making do with playard-type travel cribs, I found the Lotus Everywhere crib to be a revelation. It’s easy to use, simple to set up (and put away), convenient to carry, and sturdy and large enough to use until a child is ready for a bed without sides. Value: 8/10. At about $200 (price varies depending on where you purchase), it’s more than $100 more than the typical playard-type travel crib, but it effectively solves all of the design and usability flaws that plague cheaper models. And since it’s long and rests on the ground, it can be used for taller and heavier toddlers in addition to smaller babies. Durability: 9/10. It seems well-constructed and held up to the bouncing and shaking of an exuberant two-year old without any creaking, tippling, or toppling. Cool Factor: 9/10. Toddlers think the zippered side, which turns the bed into a lounge space/fort, is pretty much the coolest. Final Verdict: Traveling families should give serious consideration to the Lotus Everywhere Crib. It may be a larger initial investment than a playard-type travel bed, but it’s worth it for anyone who wants easy set-up and take-down, baby comfort, and the extended use period that this longer bed allows.